Some bugs are good for our gardens, some bad, says resident bug expert Arné Stander. Some six-legged creatures are vital when it comes to decomposing, pollination, seed dispersal, serving as a food source for insectivores and maintaining plant and animal community structures. Next time you get your hands dirty in the garden, keep an eye out for helpful bugs that act as pollinators, biocontrol agents, pest controllers and recyclers. These include among many others hoverfly, green lacewing, Adonis ladybird, green mantis and – believe it or not – the much maligned common cockroach. In the garden, we offer these visitors the royal treatment, with various room options in our insect hotel. The presence of problem insects on your plants is cause for alarm only when they overpopulate and cause severe damage. Reaching for insecticide might solve the problem temporarily, but will also affect insects that are beneficial to your garden. Rather than using harmful chemicals, problem insects can be dealt with by relying on more natural methods. Keeping a close watch on bug life is a good starting point in preventing damage to your plants. Here’s a list of some of the most commonly found garden trespassers. 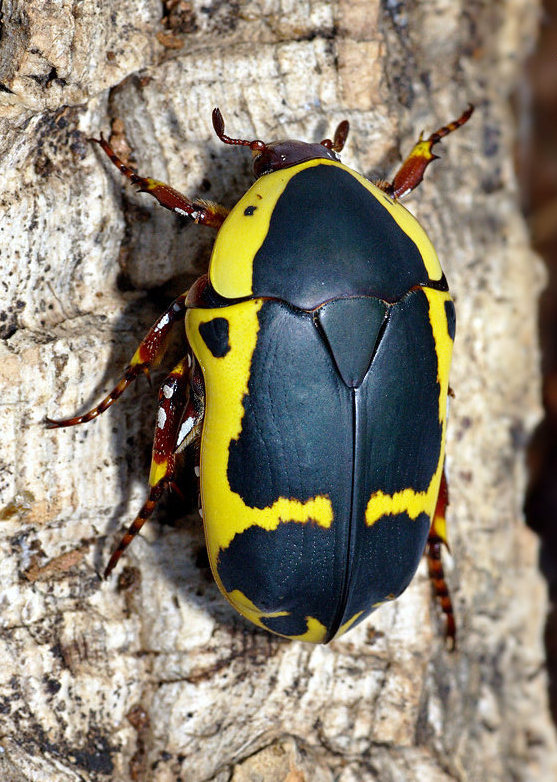 These beetles target the soft stems of the domestic fig, Ficus carica, the exotic weeping willow, Salix babylonica, the Cape willow, Salix mucronata, and occasionally peach and pear trees. Larvae bore their way into the trunk, which weakens the tree. Protect the trunks of your fig trees with gauze mesh to prevent fig tree borers from laying eggs on the trunk. See how we do it here. The cabbage white butterfly is a beautiful little creature, but if spotted in your veggie patch, it’s bad news for cabbages, as these insects spend their days feasting on Brussels sprouts, cauliflower, kohlrabi and turnip. Cover cabbage crops with netting to prevent cabbage white butterflies laying eggs. Plant nasturtiums close to your cabbage. These will act as hosts and give you an indication of when your cabbage crops need examination. Commonly found during spring when roses are in bloom, they cause irregular holes by chewing through the fleshy petals. Larvae develop in manure, compost heaps and along plant roots, they pupate in hard oval clay shells and emerge as adult chafers. Adults feed on flowers, especially roses and camellias, as well as proteas, carnations, dahlias and fruit. The rose chafer beetle can be controlled with contact insecticides like carbamate or synthetic pyrethroid. However, this is not environmentally friendly, so it’s better to hand-pick the beetles from the host plants or to rely on natural predators like birds. The larvae target many indigenous and exotic plants, especially arum lilies. Other plants include species of Rhoicissus and Impatiens. Keep a lookout for arum hawk moth larvae on the underside of these plants. Can be controlled with insecticides, but they do not feed in large numbers, so can be ignored where only a few larvae occur. Rather inspect the underside of the plant’s leaves and remove them by hand. 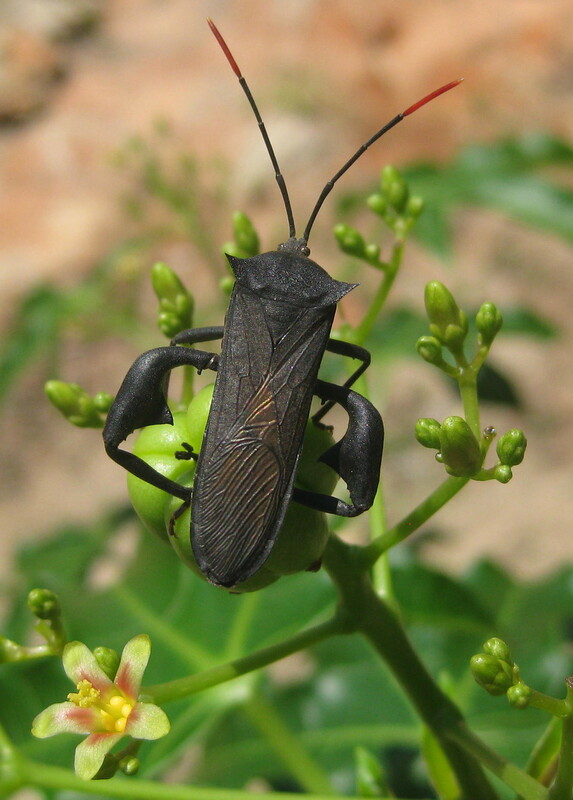 Research has shown that more than 100 host plant species are targeted by these bugs. They favour legumes, tomatoes, potatoes, eggplants and many ornamental plants. The saliva injected into plant tissue during feeding causes the entire growth point to wilt. Young trees in periods of growth flush are mostly targeted. Can be removed by hand, although it is difficult as they are very aware of their surroundings and will buzz off when approached. When numerous wilters are visible on a single plant, they can be dislodged into a container filled with soapy water. Adults overwinter under old discarded plants, so it is advisable to burn or bury plant rests. Want to learn more about how to control pests and restore balance in your garden naturally? Join our workshop on 31 May 2017. Find out more here. 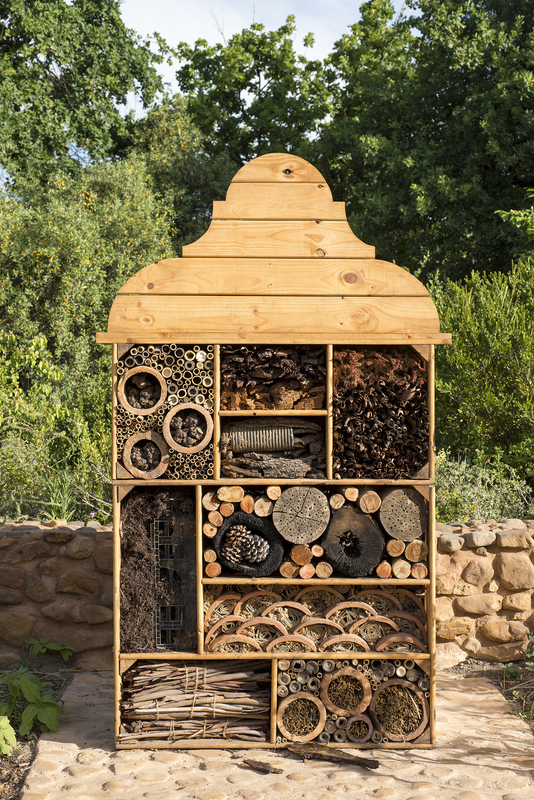 Love the photo of the Insect Hotel. Brought back wonderful memories of May last year when we spent my husband’s 70th birthday touring the gardens and lunching at your exotic restaurant. It was indeed a day to remember. Thanks too for the tip on the cabbage butterfly. We have despaired of ever seeing our cabbages cabbage, and now I know what to do!! Thank you for an interesting blog.